Haley's Amazing Stories - Boykin Spaniel Rescue, Inc.
Just about two years ago we became the proud adopted parents of Hayley Boykin Miller. She was four and was not going to be an easy brown, curley, cockeyed, tailless, cuddly, evenkeeled and shrill barking dog. She had/has numerous quirks and not knowing her training or lack of, presented many challenges. But...ever so slowly...real slowly she has decided to be part of the family. She did not look at you for a long time, but now sometimes just sits and stares at us... probably wanting a treat. And yes she still counter surfs for tidbits, but I, will admit to, now shoving all the food towards the back and blessing her cute slightly over weight heart. After all, she is a happy daughter now. About a month ago she decided to follow George up to his office, sit with him during tv time and in general be a real pal. 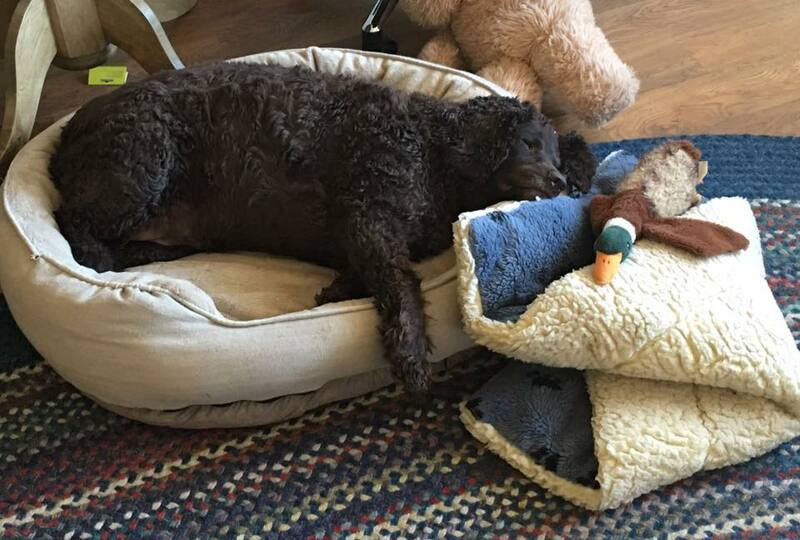 He loves it, and so do I... our last Boykin was devoted to him. Sadly, we had to put her in the "kennel" for a week while we attended a grand kids graduation and an hospital stay for George. She is in the suite, has a tv and gets walks and free time.... still I am counting the minutes till Wednesday...they even post pics! I will not do this again... I think... we shall see on Wednesday. Finally, thank you all.... Josie, Miranda, all the Rescue team, and the website that gives me a home to read and share Boykin tails... Hayley sends lick, and a woof of thanks for all the work the Rescue group does....she is very, very comfortable in her own skin now and that is the greatest gift of all. God bless all the Boykins that need a forever home, this group will do their damnedest.